The analysis of volatile organic compounds, at levels found in urban air, requires an initial sample pre- concentration to reach the detection limits imposed by the various methods, using GC/MS. Enrichment of organics relative to the fixed gases found in air is accomplished by passing a known volume of air through a trap that selectively retains the organics while allowing bulk gases to pass through unimpeded. If a trap packing (i.e. glass beads) has a low affinity for the targeted analytes, a reduction in the trapping temperature is required to allow quantitative retention of the VOC’s on the trap. This increases the affinity for surfaces by decreasing vibrational and kinetic energies that would otherwise keep these compounds mobile. When a very weak sorbent is used, such as glass beads, the trapping temperature must be between -100 to -180˚C depending on the list of analytes targeted. For method TO-14, a trapping temperature of -150°C is recommended. For sorbents exhibiting a higher affinity for VOC’s, such as Tenax and activated charcoal, trapping can be accomplished near or at room temperature. The stronger the sorbent, the higher the necessary desorption temperature for recovery of the trapped organics. A minimum temperature difference between trapping and desorption of 150˚C is common although stronger sorbents such as carbon molecular sieve can require desorption temperatures in excess of 300°C after ambient temperature sample collection. Where VT is volume trapped, PD is the pressure differential in the reservoir before and after sampling, and VR is the volume of the reservoir. The proper use of this technique is the ideal means for measuring volume from a sample container. Inconsistent flow measurements due to pressure differences do not occur since start and end pressures are all that are required. Using a vacuum pressure transducer to monitor the pressure in a vacuum reservoir, the flow is adjusted using a digital valve. The second technique utilizes a mass flow controller to directly measure STP standardized volume per unit time. In practice, the flow rate is converted to a volume either by waiting a required period of time or directly by integrating the actual flow output from the mass flow controller (MFC). Integrating an MFC’s output allows sample volumes to be changed and can also readily detect trapping flow rate upsets due, for example, to excessive ice formation in the primary cryogenic trap. MFC’s also allow the flow rate to remain constant during trapping. Since an MFC is not accurate below 10% of its range, however, the vacuum reservoir is often a preferred technique because smaller volumes may be accurately introduced into the trap with functionality using 10-1000cc’s of a complex gas mixture. 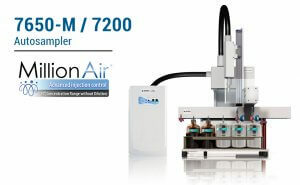 Mass Flow Controllers are typically factory calibrated using pure nitrogen gas. It is, therefore, a good practice to dilute standards in zero air so that the “air” samples can be normalized against the standards. Water also has to be managed when concentrating large volumes. Roughly 18 microliters (ul) of water are recovered from every liter of sample concentrated that was initially at 70 % relative humidity (RH) at 25 °C. Since typical sample sizes can be 500 cc, that would result in about 9 ul of water that could eventually end up on the analytical column and in the detector. That much water can foul up chromatographic resolution, reduce column life and degrade the performance of detectors. In particular, injections of over 1 ul of water into a typical bench top mass spectrometer will cause attenuation of analytes that co-elute with the water peak. The amount of sample at 70 % relative humidity that can be concentrated without water management/removal then is roughly 50–70 cc. That is not enough sample to monitor VOC’s at the sub parts per billion levels using an ordinary GC/MS. To eliminate water and improve chromatographic resolution, a second concentration stage is implemented which further reduces the sample volume. 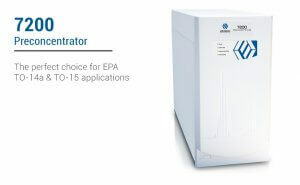 VOC’s in ambient air exist at levels that are at least three to four orders of magnitude below their saturation point. Therefore, assuming there are no absorptive surfaces, VOC’s from a 1000cc sample volume should volatilize into a 1 cc volume at room temperature after concentration if allowed to come to equilibrium. If this volume is actually flushed slowly with 40 to 50cc of inert gas at room temperature, the VOC’s could be quantitatively transferred to the gas phase. This is similar to the principle behind purge and trap analysis of water samples. In the case of air, however, initial trapping of 1000 cc would only yield 15 to 20 microliters of water rather than the 5000 ul’s used in water analysis. The distribution of the condensed water on the glass beads in the trap should further facilitate the transfer of all organic compounds to the gas phase (the rate at which equilibrium is achieved). A second three stage concentration technique called microscale purge and trap is analogous to the purge and trap used in water analysis, only on a much smaller scale. The air sample is first concentrated to about a 0.5 cc volume in a first stage cryogenic trap. The trap is then heated to roughly room temperature and held there while slowly passing helium or nitrogen through it to transfer these compounds to the secondary trap. The second trap is usually Tenax at about – 10°C. Sweeping the VOC’s from the first to the second trap with only 45 cc of helium results in a transfer of less than 1 ul of water (45 cc at 100 percent relative humidity) which can be handled quite readily by bench top mass spectrometers. After transferring the VOC’s to the second trap, they can be back flushed off while heating to be further focused on an open tubular focusing trap for rapid injection into the analytical column. Ambient level concentrations are typically quantified in the range of 1-100 parts per billion by volume (ppbv), although blank certification is required down to 0.2 ppbv. Based on a maximum carryover of 0.1% in a well-designed system, one could expect to analyze a sample 1000 times higher than the 0.2 ppbv allowable by the ambient air method blank level and still obtain a clean blank on the subsequent run. This would easily cover the expected ambient concentrations of voc’s. However, source levels can be thousands of times still higher than this. Under such conditions, system contamination is imminent. ad-sorption, ab-sorption, insufficient flushing between runs, and unswept zones (dead volume). Adsorption occurs if there is any affinity of the VOC’s for the surfaces to which they are exposed. This can be reduced by heating exposed surfaces as well as by utilizing inert materials. Absorption can occur when VOC’s are exposed to polymeric materials such as Teflon and Nafion, which absorb and off gas quite readily. Carryover due to insufficient flushing can be eliminated by making sure the flushing of lines occurs all the way up to the next canister to be analyzed before concentrating a sample from it. A thin film of fused silica should line sample flow paths entirely as exposed metal oxides should not come into contact with polar compounds. Tubing with a fused silica lining does not need water to passivate the surface, so extractions in completely dry conditions will provide the same recoveries as extractions in humid conditions using a surface coated with an inert polymer. Fused silica coatings are also capable of recovering higher molecular weight compounds, as these compounds can be released by mild heating. Worthy of more discussion is the concept of un-swept volumes within a flow system. These are volumes that are not rapidly flushed during cleanup operations because of the lack of a clear exit flow path. The most commonly found un-swept zones in pre-concentration systems are in the fitting connections and valves. Even so-called “zero dead volume” fittings have a gap between the tubing and the wall of the fitting where contamination can reside out of normal flow regions, especially when exposed to high VOC levels for an extended period of time. The size of this un-swept volume is affected by how squarely cut and dressed the end of the tubing is that joins with the fitting and how far down in the compression fitting the tubing is seated. Developed in the very early 1990’s, the configuration described is still the most used for the analysis of Hydrocarbons, Carbonyls and both TO-14 and TO-15. Other, even more, advanced multistage trapping systems have been developed by Entech for headspace analysis and include the addition of Semi-Volatile Organic Compounds (SVOCs), Siloxanes, and Sulfur compounds.